In 2012, Lauren Englund had a vision: create a community space dedicated to education, nature and beauty, where people of all ages could connect and learn about the role ecology plays in our everyday lives. She also has a passion for beekeeping and the importance of pollination. After nine months of community meetings, hoop-jumping, grant writing, and volunteer-gathering, work parties began transforming a small corner of the High Point Community P-Patch into a bee-centric garden. 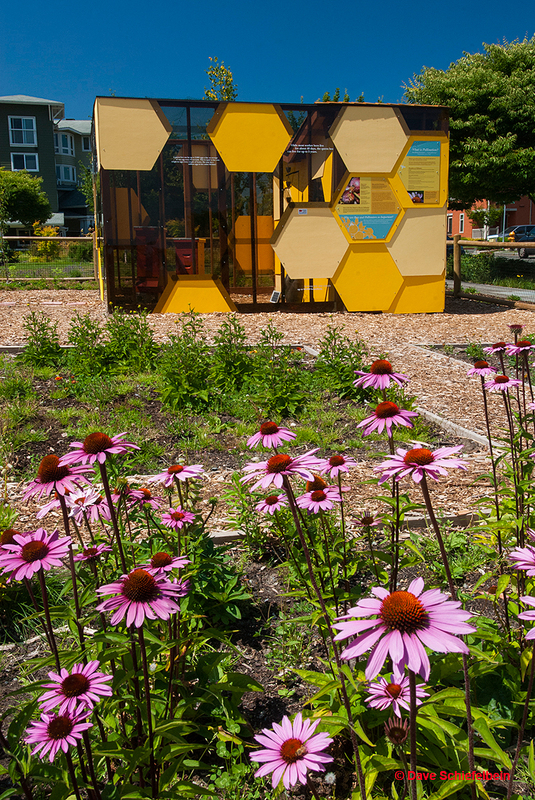 The West Seattle Bee Garden now supports three hives in a special enclosure designed by a volunteer architect who also led the build of the enclosure. The hives are easily viewed on three sides through large Plexiglas walls. A number of informational signs surround the enclosure and garden. West Seattle Elementary students created a stunning, bee-themed mosaic inviting visitors into the garden. A volunteer landscape architect helped design a garden that is attractive to bees year-round. Beautiful blooms of black-eyed Susan, bee balm, echinacea, and annual cosmos attract human visitors as well, who come to sit and enjoy the blooms and the humming of the bees. The West Seattle Bee Festival has become a popular annual event taking place each May at High Point Commons and the Bee Garden. It includes interactive activities for children; art, music and science activities; a plant swap; a Bee Parade; and, of course, learning about bees with a Hive Demo. Puget Sound Beekeepers also offer honey tasting and sales.